Transit Lounge Else is an international project of the Else Lasker-Schüler-Society (Wuppertal) in cooperation with the Center for Persecuted Arts (Solingen), designed by the artist duo Astronautenkost. The focus is on the life and the marvellous work of the artist Else Lasker-Schüler. 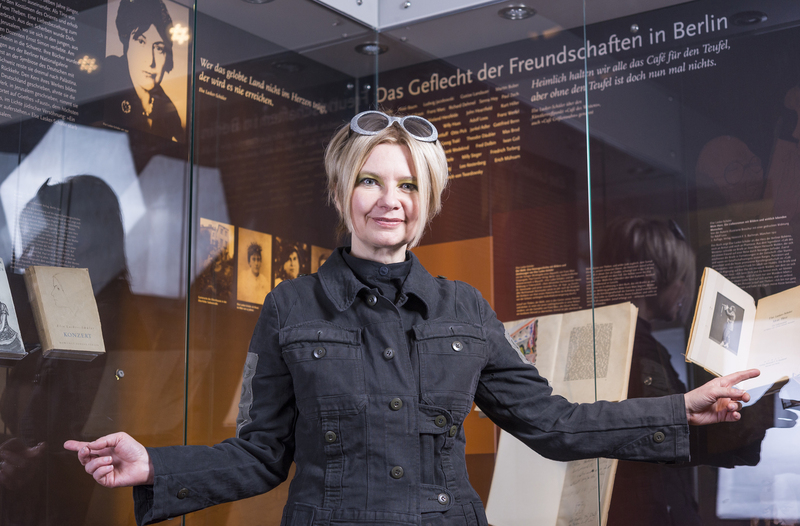 The actress Claudia Gahrke and the director Andreas Schäfer invite people to speak poems of the most important German lyricist. 40 renowned artists have already taken part, including Iain Glen, Bob Balaban, Elfriede Jelinek, Sigalit Landau, Tomi Ungerer and John Nettles. The way in which a state treats its artists is a litmus test for democracy. The persecution and fate in exile of an artist is exemplified on the basis of the lyricist Else Lasker-Schüler. In a mix of short informative presentations, readings of Else Lasker-Schüler’s poems and prose are held in German and in the local language. Before New York, the project took place in Stockholm and Los Angeles, places where many artists had been in exile. The project is a tribute to the great artist, whose 150th birthday will be celebrated in 2019, and a sensual feast for the freedom of art. Its patron is the actor Günter Lamprecht. The third station will take place at the Goethe-Institut New York, which is also a cooperation partner of the project. With Claudia Gahrke, Andreas Schäfer and Professor Andrea Krauss from the New York University. The New York actress and singer Eleanor Reissa will read the poetry of Else Lasker-Schüler in English translation. The project is funded by the Federal Foreign Office of the Federal Republic of Germany and co-presented by the Goethe-Institut New York. The Else-Lasker-Schüler-Society recalls the fate of emigrated and persecuted intellectuals (artists, natural scientists and humanities scholar, journalists and writers, whose books were burned, whose works of art were censored and banned) in this epoch of great refugee flows by means of its international forums from Prague and Breslau to Catania and Jerusalem. The ELS Society has around 1,200 members, including many prominent artists and politicians. More than a dozen almanacs document its activities in schools, as well as the premieres of theater plays and compositions. The Center for Persecuted Arts operates under the umbrella of the Kunstmuseum Solingen. Claudia Gahrke, acting training in the master class with Actors Studio founder Robert Lewis, speech training with Günter Wirth. She was a scholarship holder at the Berlin Theatretreffen. Many theater roles, among others: Merteuil in Heiner Müllers „Quartet“ in London. Performances in Brussels, Cambridge and during the EXPO2000, amongst others: Ophelia in the Sound-Performance “Hamletmachine”, Haus am Waldsee, Berlin. “Kitty Hawk” in “I’m a Microbe” for the Fraunhofer-Gala “Fest der Forschung” in Dresden with Herbert Fritsch. Readings amongst others: “About the Eternities between the Many and the Few” – Alfred Döblin und Else Lasker-Schüler with Günter Lamprecht and „All is Jazz“, by Lili Grün, for the first „Festival for Persecuted Arts“. Performances, with Else Lasker-Schüler-settings, took place at the Jewish Museum in Berlin and in Wroclaw. Guest appearances in “Life? Or Theater?” by Charlotte Salomon, in Vienna, Berlin and Tel Aviv. Many roles in WDR plays. In 2011 her CD “Die kreisende Weltfabrik“ (“The Orbiting World Factory“) appeared, with poems, prose and letters by Else Lasker-Schüler. 2014 recitation of Durs Grünbein for the opening of the exhibition “Socks for Life” in the European Parliament in Brussels. Andreas Schäfer is a director and author. He attended the master class directing with Robert Lewis (Actors Studio). Productions in Israel, London, Barcelona, Berlin, Brussels, and at the EXPO2000. Schäfer writes an essay series on communication and art in the 21st century and reference book contributions. Interviews with Hellmuth Karasek, Prof. Michael Schirner, Bert Neumann, Denis Scheck, Tom Stromberg, Heike-Melba Fendel, Jan Hoet, etc. Since 2009 he is the executive editor of the magazine “showcases”. In 2012, an interview with the title „Durch den menschlichen Kosmos“ (“Through the Human Cosmos”) was published. In 2011, he directed the CD production „Die kreisende Weltfabrik“ (“The orbiting world factory”) with texts by Else Lasker-Schüler. In 2014 he curated the exhibition “Socks for Life”, among others with works by René Böll, Elfriede Jelinek, Robert Wilson, Ruprecht von Kaufmann and Andrea K. Schlehwein in the European Parliament in Brussels. He received an Euorpean Best Event Award for this. Andrea Krauss is Associate Professor of German at New York University. She received her PhD from the Free University of Berlin in 2001 and her venia legendi (habilitation) from the University of Zurich in 2010. Before joining NYU she taught at the Johns Hopkins University from 2009 to 2017. Her research interests include exile literature and literature after 1945, the intersection of literature, philosophy, and aesthetics from the eighteenth century to the present as well as literary theory and methodology. She is the author of “Zerbrechende Tradierung: Zu Kontexten des Schauspiels ‘IchundIch’ von Else Lasker-Schüler” (Passagen, 2002) and “Lenz unter anderem: Aspekte einer Theorie der Konstellation” (Diaphanes, 2011). She edited the special issues “Constellations” (2011) and “Avant-garde revisited: Else Lasker-Schüler” (2017) of MLN and has published numerous articles on authors such as Hamann, Lessing, Lenz, Goethe, Eichendorff, Jean Paul, Rahel Levin Varnhagen, Nelly Sachs, Celan, and Sebald. Eleanor Reissa is a Tony nominated director, Broadway actress, Israel Prize nominee, award-winning playwright, and singer in Yiddish and English. She most recently appeared on Broadway in Pulitzer Prize-winner Paula Vogel’s play, “Indecent”. Before that she starred and directed Sholem Asch’s play “God of Vengeance” in Yiddish at New York’s La Mama. She has been called the Yiddish Edith Piaf, and is one of the world’s most renown interpreters of Yiddish music. She had sung in every major venue in New York including Carnegie Hall, Avery Fisher Hall, Town Hall, Symphony Space, as well as at international festivals around the world. Last year an anthology of her plays, “The Last Survivor and Other Modern Jewish Plays”, was published. She has received writing commissions including “Yidl Mitn Fidl” for Yiddishpiel in Israel, and “Hershele Ostropolyer” for the National Yiddish Theatre Folksbiene, which she helmed from 1998-2003. She is currently working on a new Yiddish opera based on Isaac Bashevis Singer’s “Taibele and Her Demon” with composer, Judd Greenstein. Her latest recording, “Vilde Mikhaye” (Wild Ecstasy) with the Grammy winner Frank London and the Klezmer Brass Allstars, will be featured in a European tour this November.